Teaching gratitude to KIDS: The sudden kind we feel for what we take; the larger kind we feel for what we give. 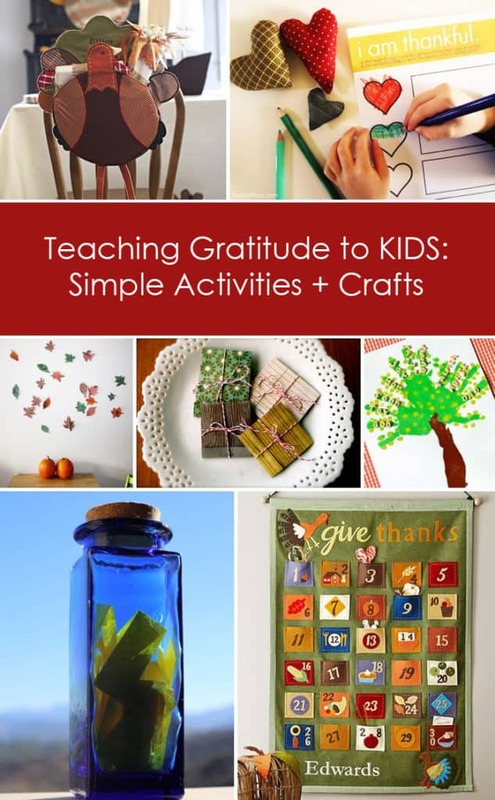 Help your children experience that larger kind of gratitude with these simple activities. Take a moment to go read Why We Need Novembers from The House of Hendrix. I just adore this idea. It focuses on gratitude every day and then the annual tradition it leads to on Thanksgiving, well … I thought it was the bee’s knees. Now, if you’re a regular reader here, you know I adore our family’s Christmas advent calendar. I am always searching for ways to take the holiday advent calendar beyond chocolate. I just loved the simplicity of Allison’s idea above. 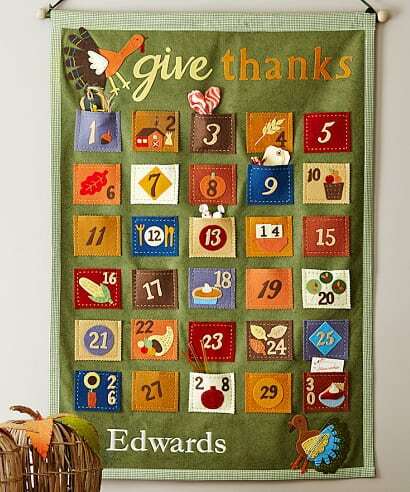 In fact, I loved it so much that I bought myself an adorable Thanksgiving Countdown Calendar today on Pottery Barn. I thought this tree version was adorable, too. If you’re not looking for a monogrammed calendar, check out this cute Thanksgiving countdown on Amazon. The price is a lot more reasonable! While I was shopping around, I also found these adorable chair decorations. If you’re not interested in hanging an advent calendar, this could also be a sweet way to collection “I am thankful notes” from the family to share. These chair back decorations are reasonably priced, but you could easily have the kids MAKE festive envelopes to attach to their chairs instead. Have your child decorate a cereal box with a hand print turkey and attach it to the chair! My girls LOVE painting on themselves. This project is AWESOME. What a lovely year-round tradition that comes together at Thanksgiving. Give “a heart” to a friend or family member when they make you happy. A simple activity + printable for kids. 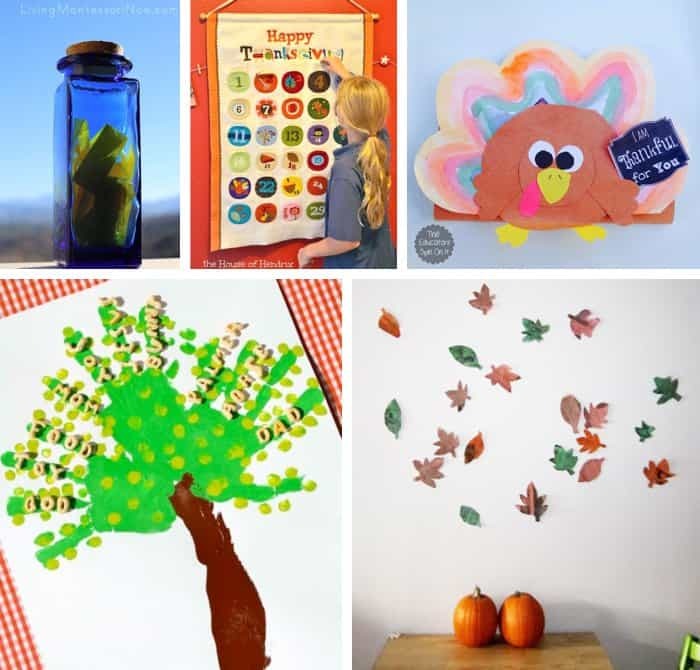 Create newspaper leaves and share what you’re most thankful for… what a lovely tradition. Check out this adorable turkey chocolate bar wrapper project + free printable! Even if your child is too little to write, you could create a drawing gratitude journal. Love this. Simple Post-it trick for sharing gratitude with your kids and appreciating the mess of childhood. Looking for an ongoing resource? 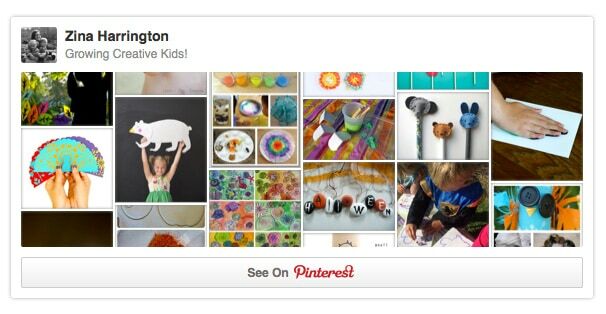 Follow Growing Creative Kids, which is a collaborative board on Pinterest where parents, teachers, and bloggers come together to share unique kids projects. What are you thankful for today? Let’s chat in the comments. P.S. Looking to show a little gratitude with a handmade gift this holiday season? Click here to check out last week’s Kids’ DIY Handmade Gifts round-up. For starters, I love the quote. Pinning now. Such a lovely post! I am at the other end of parenting now with my children spreading their wings. Gratitude was an important part of our family – each Sunday we have family meetings and share what we are grateful for. I have saved our notes (in a binder) for the past 21 years! and together they illustrate a lifetime of things to be grateful for. 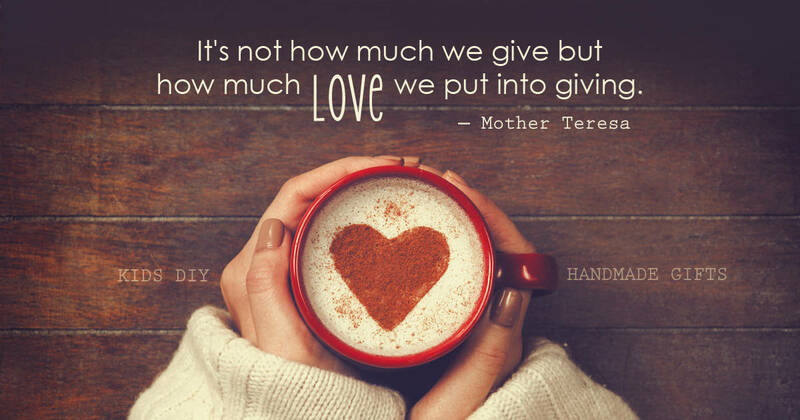 My children have grown to be kind and generous people and I believe that part of this is in response to being very aware of the blessings they have experienced while growing up. I really enjoy reading your blog. I am a kindergarten teacher so am able to use many of your ideas. I love these ideas… I worry that my girls don’t understand gratitude enough… I need to try some of these.